Off white coloured, Semi-Translucent, barrier coating of approx. 3mm thick. Hot dip applied. 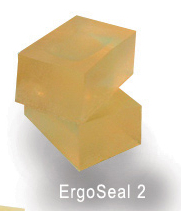 Ergoseal 3 is a semi – translucent, off white coloured hot-dip applied reservoir core enveloping / encasing barrier coating of approx. 3 mm thick. It imparts mechanical protection all over the essential vapour barrier No.1 film (Saran, polyethylene etc) and No.2 premium thickness (30 micron) aluminium foil wrapped core. 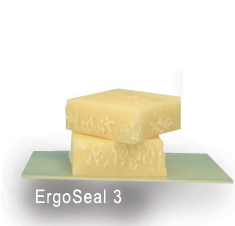 For successful long-term ErgoSeal fluid preservation, use a pliable but bare solid suspension wire during the dipping process. Plastic monofilament may perish and fibrous twine may act as a capillary wick to enhance fluid losses during the storage period.It is removed from the core by hand stripping after making a cut in the tough solid coating. 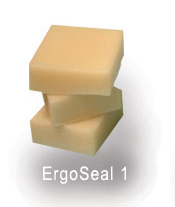 Cleanly removed uncontaminated ErgoSeal is reusable by melting first in a separate heating bath and examined for quality before adding to newly melted stock.